I can’t argue about the taste and I’ll have to take Pieris’s word for the health, but frankly, if it was good enough for Cleopatra to bathe in, it’s good enough for me. The people of Cyprus have had to face some very tough challenges over the years, perhaps the toughest of all in 2013 when many of them lost life savings overnight. But despite all this, their hospitality and will to succeed seemingly remains undiminished. 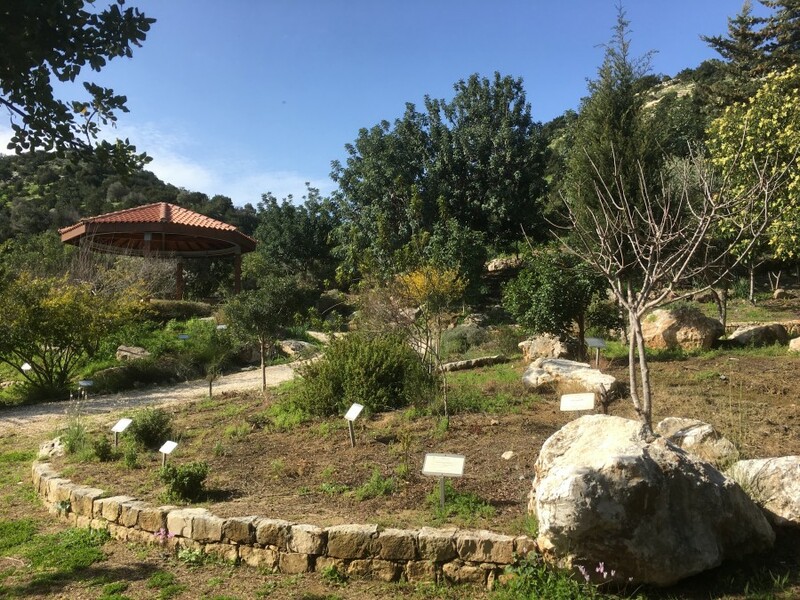 Never more so than up in the mountains above Paphos and Limassol where young people have moved back to their once abandoned villages to resurrect a way of life that at one time seemed a lost cause. 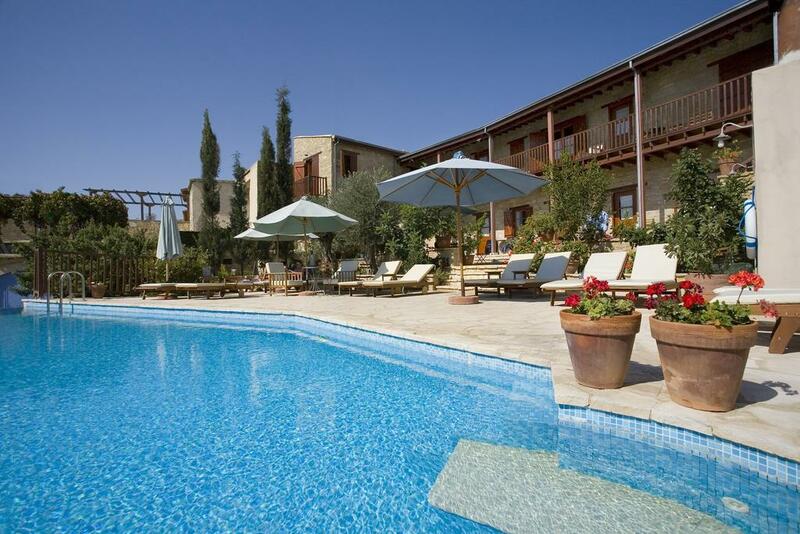 It’s a far cry from the hedonist beach resorts of Ayia Napa, Larnaca and Limassol but budding entrepreneurs have converted crumbling ancient houses into luxury agro-tourism, traditional bread and cheese making is in high demand and creative artisans have opened trendy studios and workshops. Of course, all this activity has boosted traditional ways and practices that were in danger of disappearing; cue the lace makers, silversmiths, herbalists and many outstanding family wineries and tavernas going back generations. Up here you come across antiquities for fun. Here, a 15th-century water mill, there, an 11th-century fresco or a perhaps an original Venetian bridge or two. It’s like travelling through a living time machine. At the impressive Leonidas Village Houses complex near Goudi, a lone cockerel announces morning has broken. Even though it’s the middle of March, the sun is drenching the terrace and it’s warm enough to eat breakfast outside. My fellow tenants are in a clutch of beautifully restored 1 and 2 bedroom houses around a communal pool and seem to have the same idea as me. I drink my first coffee before I set off staring at the sweeping views across the valley. This may be remote, but it’s utterly beautiful. The Baths of Aphrodite close to Latchi at first glance might feel like something of a tourist trap, but things have changed dramatically from my memories of it many years ago. Back then there was a handwritten sign and a dirt road up to the baths which is, in reality, a spring at the entrance to a grotto. Today you have to park some way down and walk up to it through landscaped botanical gardens full of wildflowers and fig trees. But it’s the trails leading off from here that is the draw for me. 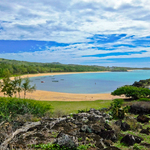 A number of walking trails offer up sweeping views of the bay and the peninsula. 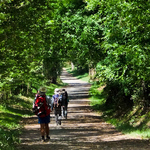 Hardy trekkers can attempt the 7K Adonis circular route which is a climb but well worth the effort. 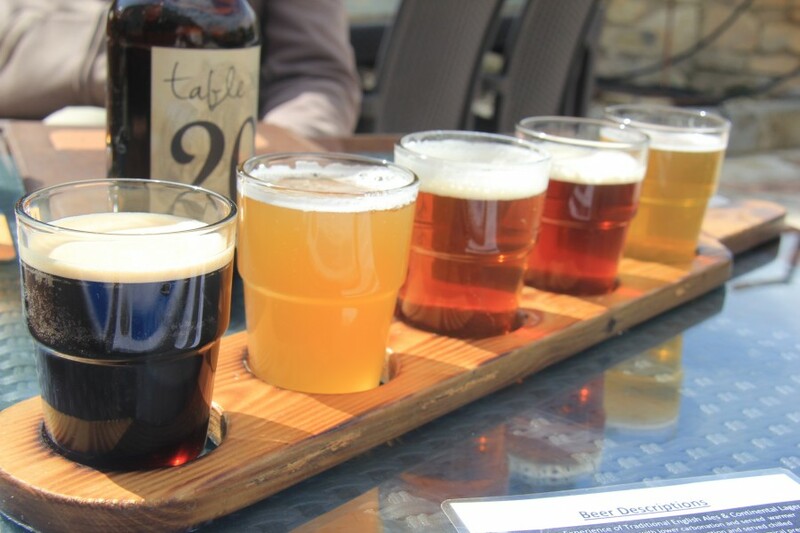 After all that effort I’m rewarding myself with a few cool beers at Aphrodite’s Rock Microbrewery in Tsada. There’s no doubting Aphrodite got around a bit on Cyprus, there are so many things named after the goddess of love, but Bill and Jean Ginn have done their fair share of travelling, coming here from England and setting up this excellent craft brewery. It’s a proper family business with daughter Melanie a qualified brewer, Bill designing the process and Jean lording over the food. But don’t expect any local fare, as Bill points out to me “There was no point in us offering a Cypriot menu as all our customers can get that everywhere they look. So we unashamedly went for good quality fresh international food. We even got our wood-fired pizza oven over from Naples.” I try the flight of beers, a tray of five different samplers and I reckon even Aphrodite would have approved. Tearing myself away from the beer I visit Letymbou village where Sofia and Andros have opened up their home to visitors to demonstrate how their family has made halloumi and baked fresh bread for the village for generations. 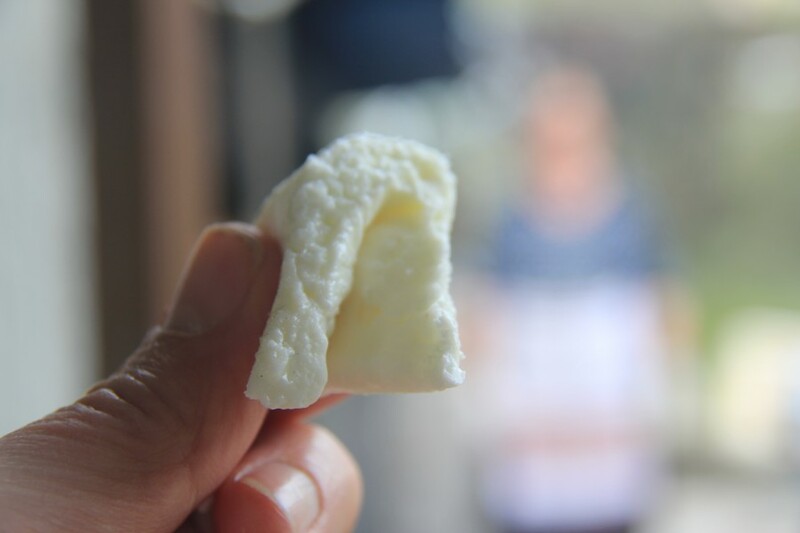 Frankly, eating hot halloumi straight out of the pot is a deliciously rare treat. Sensing my eagerness to learn her secrets, she takes me into her kitchen to roll out the dough for what I can only describe as a Cypriot pasty. I mess it up and Andros gives me that knowing look as if to say don’t worry after a lifetime together, she still does it better than me. Reluctantly I return to my Leonidas house for a short rest. Mandatory really as I’m having dinner at the Moustakallis Taverna in Polis, named after Papa Moustakallis “the man with the large moustache.” These days son Andreas is at the helm assisted by his son Kyriakis although Papa still comes in every day. Three generations of restaurateurs still treating customers like family. I’m greeted like a long lost son by Andrea who guides me to my table before issuing a barrage of orders to wife and head chef Natasha in the kitchen. 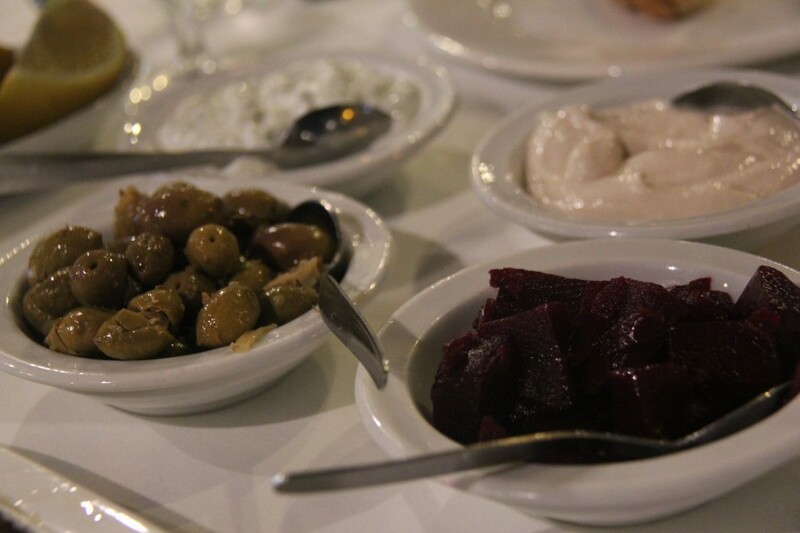 It seems I’m having the meze feast whether I want to or not. It is a dinner of godlike proportions, both in quantity and number; untold plates of regional specialities sourced locally and genuinely delicious washed down with a very tasty local red. It’s a sunny morning and the cockerel bades me farewell with a final call as I set off for the Troodos Mountains, high enough for snow and skiing. On the way to Omodos village, I hit the highest peak at 1,900 metres and the Troodos Square ski resort. The toughest slope for advanced skiers is Zeus on the north face at 500 metres long. Who knew you can ski in Cyprus. Omodos, much lower down the mountain and thankfully snow free, is a charming village with narrow twisty lanes. There’s plenty of shops offering free local wine tasting and locally made olive oil and shoushouko a tasty treat made from dried grape juice and carob and filled with almonds. 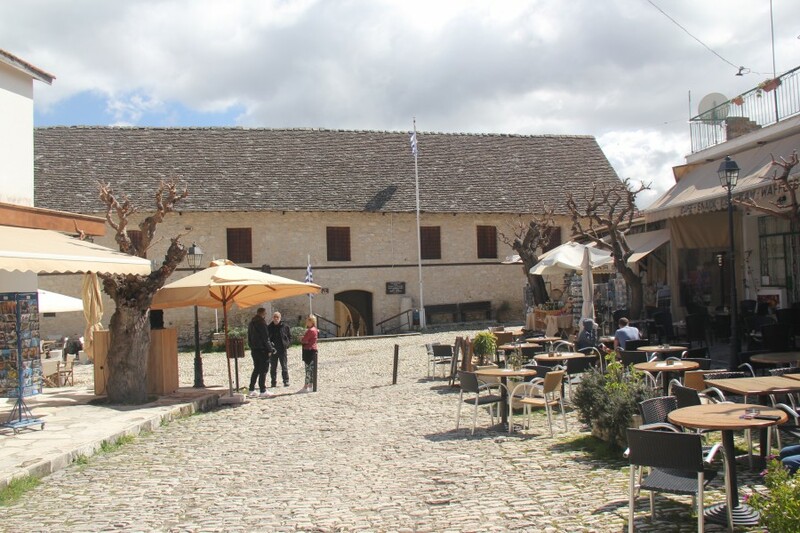 By the main square is the 17th-century Monastery of the Holy Cross which contains rare relics recovered from a field hidden there by monks fearful of losing them to Ottoman invaders. One of them contains a fragment of rope said to have been taken directly from the Holy Cross. 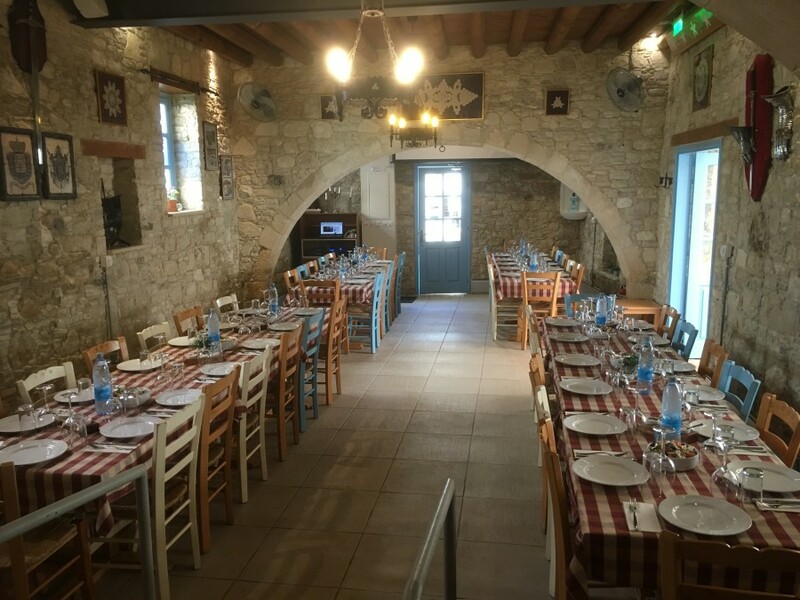 Tucked away in a narrow lane is To Katoi, a quite beautiful restaurant that is a former family home dating back to the middle ages. During the two year restoration, all kinds of long-lost family treasures were unearthed and subsequently used in some way within the renovations. It is elegantly medieval yet wonderfully current. 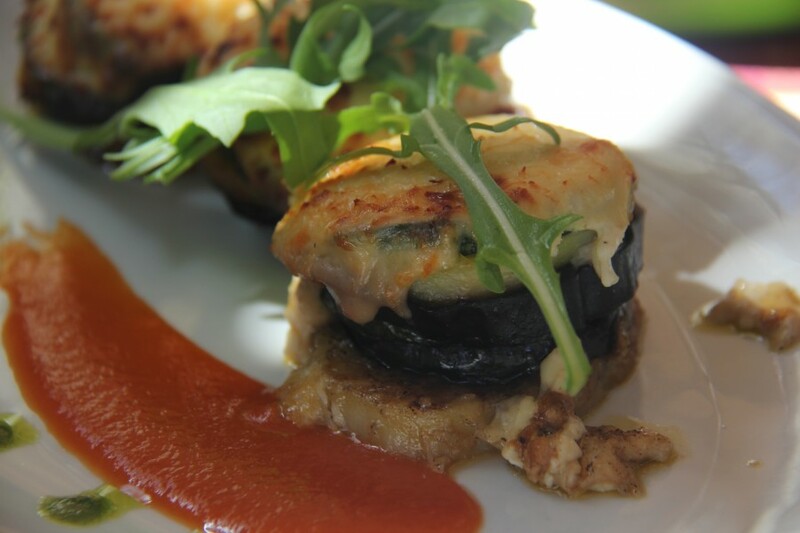 The food, prepared by Chef Panagiotis a culinary veteran of the Four Seasons Hotel, is simply divine. 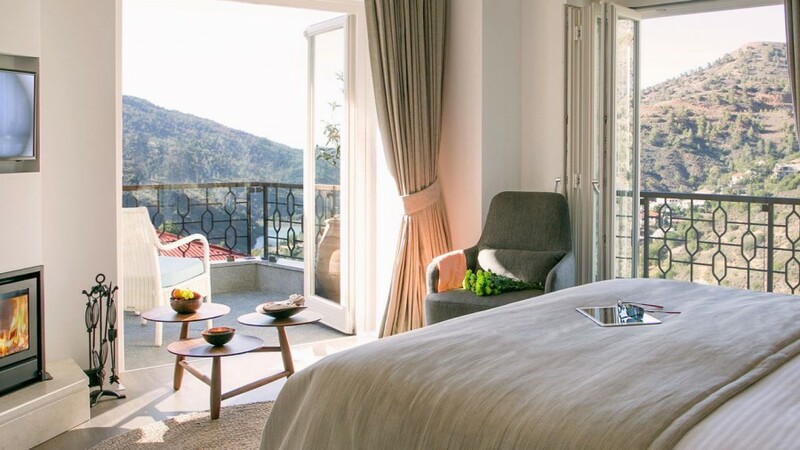 For my next adventure I spend the night in yet another surprise venue; Casale Panayiotis, a luxury hotel and spa which is made up of 50% of village Kalopanyiotis. 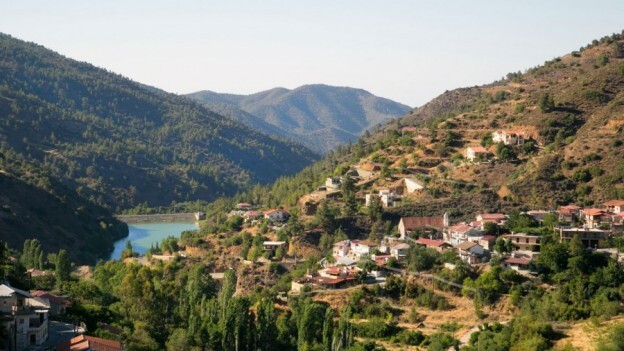 As owner John Papadouris says “it was not my intention to start a business, it was to revive a village.” The village, clinging to the side of this spectacular Troodos valley, had for centuries attracted pilgrims to bathe in its sulphur springs and visit the frescoes of the UNESCO Saint John Lampadistis Monastery. It was where Papadouris grew up and after finding fame and fortune, he returned to find it mostly abandoned and derelict. So slowly, he bought property, house by house, and turned each one into a designer hotel room. Staying here, in one of the 40 odd rooms, you are quite literally immersing yourself in village life. Integrated into the village are three restaurants, a world-class spa, a guest library and plans to add an outdoor pool next summer. This is quite an extraordinary place. The village of Tochni in the Larnaca district is said by many locals to be one of the oldest in Cyprus dating back twenty centuries and was the traditional home of the island’s master stonemasons. 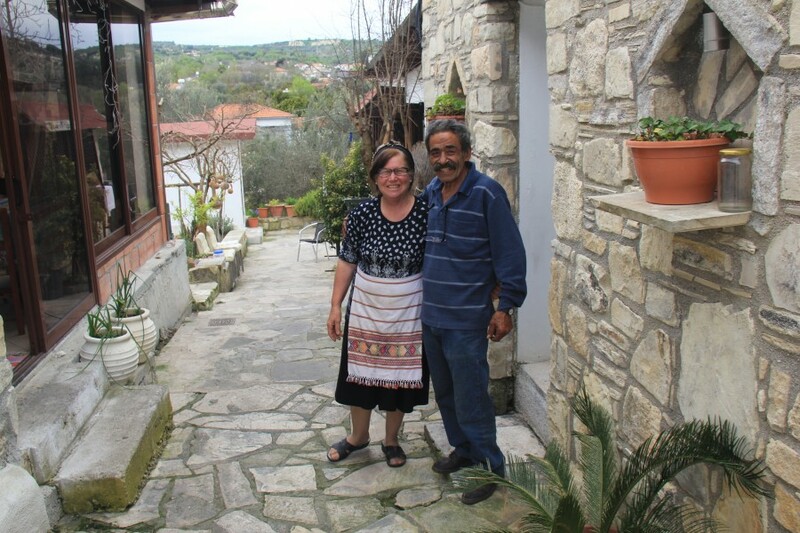 Klea and Andreas Eveleos first opened the doors of Eveleos their traditional rustic country house, just a 5-minute walk from the village square, some fourteen years ago. They’ve seen many changes over the years but with them, some things never change. There’s always a welcome pack in each apartment with enough food for a short siege, and a cocktail or three with them in the courtyard to toast being their guest. Taking the short walk down to the square I eat a cheap tasty dinner at Nostos, a local family-run taverna where the barbecue grill is in full swing outside on the terrace. Plenty of regulars, and a table full of kids who apparently eat here every Friday night together. You can’t get more local than that. Owner Irene originally hails from Tooting in London before coming here 10 years ago to take over her grandparents’ coffee shop and transform it into Nostos. The Neolithic settlement Choirokoitia is a UNESCO treasure; one of the most important prehistoric sites in the eastern Mediterranean. Its remarkably well-preserved circular houses and other priceless artefacts have provided archaeologists with vital clues to the evolution of human culture. A short walk up to the more modern village of the same name reveals another work in progress. I meet local mayor Eleni Theodorou who shows me around some of the work being undertaken to bring the village houses back to their original design after the British “renovated” them before independence. 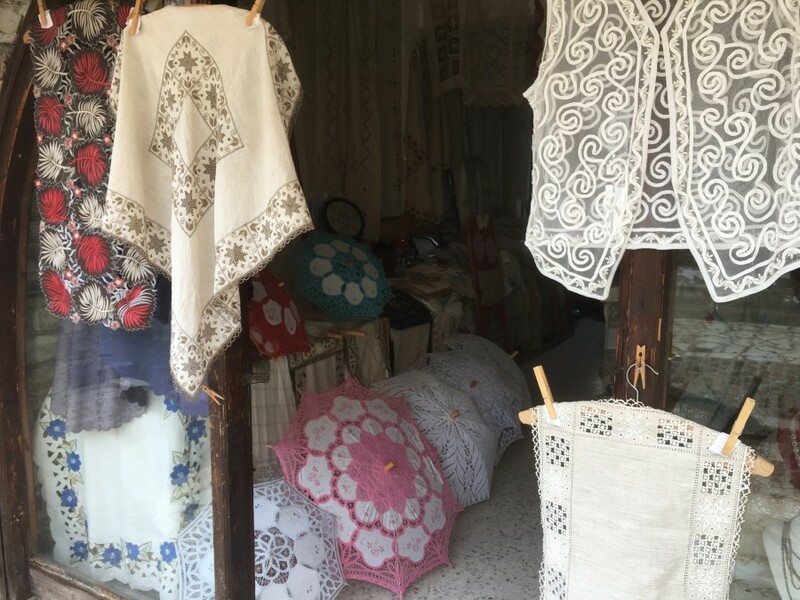 I’m making my way back to the coast for my last night but before I head for Limassol I visit nearby Lefkara, famous for its needlework lace embroidery and filigree silver. You can find Lefkara lace all over Europe, even Leonardo da Vinci was said to be a customer, buying a lace altar cloth as a gift for the Cathedral of Milan. It’s a lovely village to stroll through, many of the artisans sitting working in the doorway of their workshops. Lunch at the Pavilion Restaurant is beyond memorable; a feast of melt in your mouth Tava which is baked lamb with fresh salad. It’s a speciality they’ve been serving for over 30 years. I spend my final night in the welcoming embrace of the legendary Amathus Beach Hotel on Limassol’s beachfront. 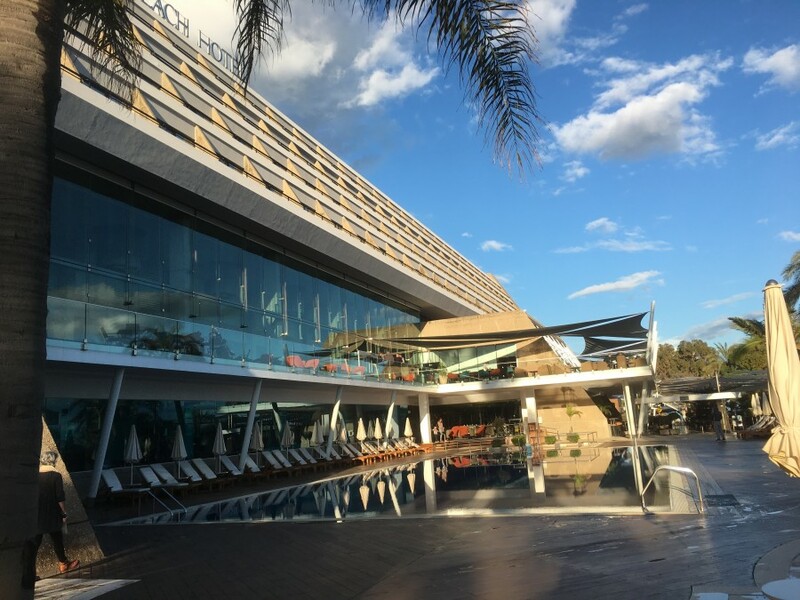 This 5-star hotel has been a Limassol landmark for decades and with her recent refurbishment, she’s looking better than ever. 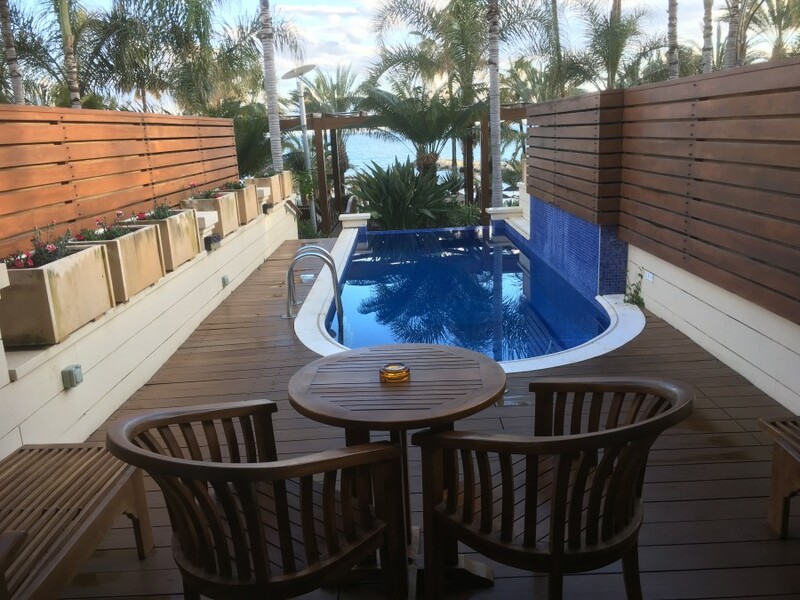 I am rewarded for my tour of rural Cyprus with beachfront suite complete with its own infinity pool and private loungers. Sometimes you just have to give in to temptation and kick back to the sounds of the ocean. 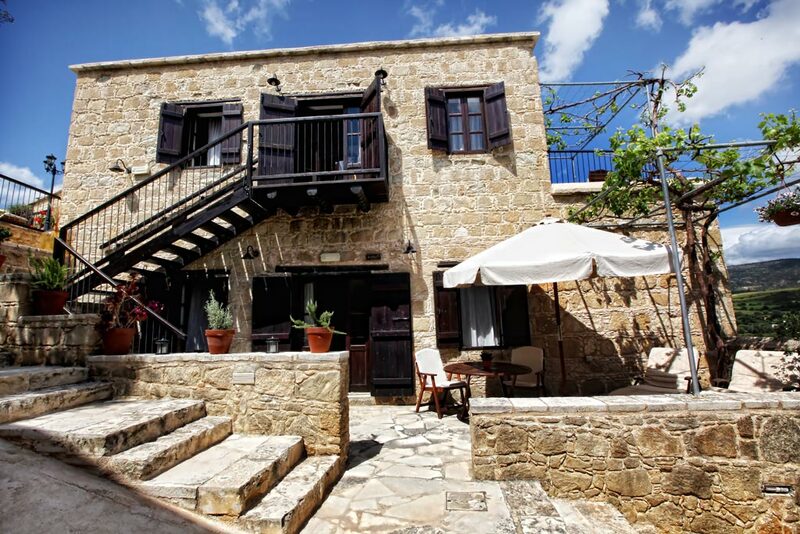 Touring Cyprus’s rural landscape and her wonderful villages is an experience not to be missed. It’s a portal to a way of life that hasn’t changed in centuries. And now, with so many young Cypriots returning to create exciting new businesses, it offers a far different experience than simply soaking up the sun on the beach. Just make sure you drink some of that delicious donkey milk. You never know, it might give you skin as soft as Cleopatra. Casale Panayiotis Markou Drakou 80, 2862 Kalopanayiotis, Nicosia Cyprus. Aphrodite’s Rock Brewing Company, Polis Road, Tsada, Paphos 8540 Cyprus. 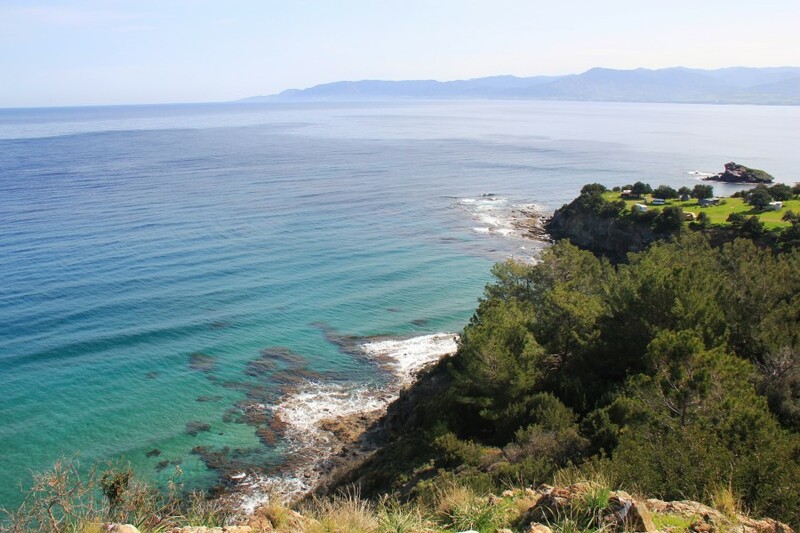 Easyjet operates regular flights to Paphos from London Gatwick. Taking you straight from Gatwick Airport to the heart of London, Gatwick Express’ high-frequency, non-stop shuttle service to London Victoria has real-time passenger information systems, air-conditioned carriages, power sockets and is Wi-Fi enabled. Booking an airport hotel with Holiday Extras ensures that you can enjoy more holiday without the hassle. To book the Sofitel at Gatwick Airport for £135 *, visit Holiday Extras or call 0800 955 5989. *Price searched on 1st April 2019 for arrival on 18th May 2019.